Gov. 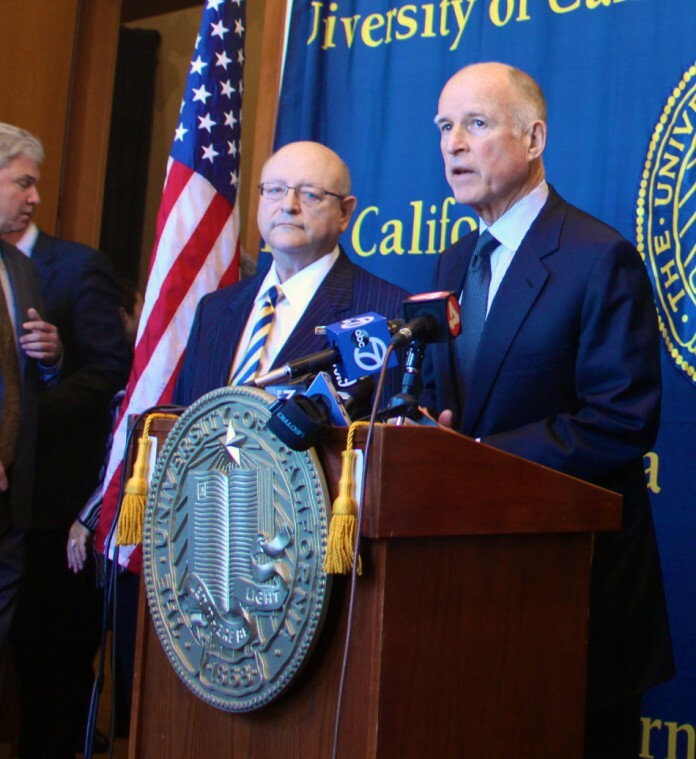 Jerry Brown unveiled his new balanced budget for the state of California on Jan. 10. The new budget includes much needed restoration to public education funding; however, the governor is still urging schools to close the monetary gap by increasing their efficiency. When Brown took office in 2011, he faced a budget deficit of just over $25 billion. Now, he says, there’s a modest surplus left over after affording extra money to public schools. The governor’s new budget proposes that an additional $2.7 billion be allocated to public education with the University of California and California State University systems reaping $125 million each from the new deal. The $250 million awarded to the UCs and CSUs follow the $250 million reinstated into the budget thanks to recent voter-approved tax increases. Political and education officials have praised Brown for effectively reducing the deficit and simultaneously increasing funding for schools. Brown, however, hasn’t yet stopped to admire his work and is still looking with foresight to improve the efficiency of public education. Budget Director Ana Matosantos followed Brown at the press conference, answering questions and providing elaboration on the new budget. “The expectation is that fees will remain level,” said Matosantos at the press conference, responding to a question about possible increases in UC and CSU tuition despite increased government funding. She went on to specify that maintaining reasonable tuition costs was a responsibility that resides within the UC and CSU systems. These, along with other efforts to increase funding for schools in poorer regions through “concentration” grants, are all commendable affirmative actions on the part of the California state government to improve the quality and equality of public education. However, with universities like UC Santa Barbara receiving a record high number of applications for fall 2013 – 76,026 undergraduates and a 14 percent increase in freshman applicants, the puzzle of figuring out how to accommodate waves of incoming students with the same amount of public funding may prove to be a difficult struggle. In response to these obvious difficulties, Brown is expected to attend the CSU Board of Trustees meeting in Long Beach on Tuesday, Jan. 22, still intent on ensuring quality education for students and working to help public universities improve their efficiency. It is precisely these intents that provide a display of good faith between bureaucrats and school officials, and which may finally indicate the turnaround in public education demanded by students, parents, and school officials for so long now.